USA Patriotism! proudly recognizes . . . patriot Eric Horner for his ongoing support of our troops through his performances and other activities. Eric Horner was born and raised in Paducah, KY. Growing up without military in his family, he knew very little about the armed forces and the sacrifices they make. At least not until signing on as a guitarist and backup vocalist for country superstar Lee Greenwood in 1988. Greenwoods patriotic anthem "God Bless the USA" played a big role in introducing Eric to the military by way of USO and Department of Defense tours around the globe. Eric made many friends in the armed forces as he traveled and had begun to understand the military way of life and their sacrifice. That understanding was driven home when he met his wife Debby in 1998. Debby's first husband was one of the Marines killed in the terrorist attack on our Marine BLT compound in Beirut Lebanon on Oct 23rd, 1983. Debby taught Eric a great deal about the depth of the military sacrifice. 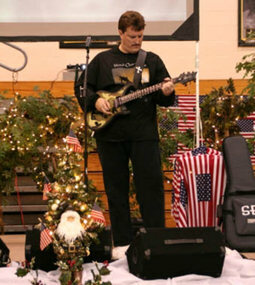 His first patriotic song writing effort came in September of 2001 and was entitled "We Will Stand". It became a hit all across America as our nation began to rebuild and heal after the terrorist attacks in New York City and Washington D.C.
From there Eric began writing to honor many different veterans groups paying special attention to those who served our country in Vietnam. It wasn't long before the songs began to pour out his heart in abundance about our active military and the job they do. Eric currently performs on many of our military bases sharing songs of encouragement, motivation, and inspiration for our troops. He writes each base a theme song that can become their own tool of motivation for the soldiers. Eric Horner's following thoughts deeply show his love of America and the special place in his heart for those who defend Her. "This is my heart . . . 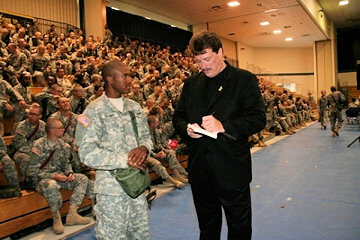 I want those soldiers to know how much I appreciate and support them . . . We can't say thank you enough to those who defend our freedom. I believe our troops are a shining example of the very best that America has to offer. I will do everything in my power to support and encourage those who are willing to lay their lives down for me. I believe it is our duty as American citizens to support them in any way that we possibly can. After all, they ARE the reason we are free! And it's awesome to see the troops respond to the music, which is all about honoring them for their proud, brave service . . . and pride of America." 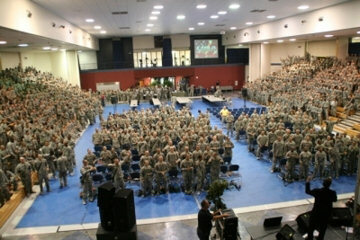 Since he began his "Victory" Concert series for the military in 2005, Horner has had the opportunity to visit many of our military bases to present patriotic, motivational concerts in front of approximately 100,000 soldiers to date. 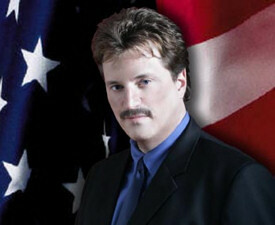 Eric Horner's music videos listed at USA Patriotism!